Gas stoves and fires make a wonderful heating choice, offering striking aesthetics but without the need to source wood fuel. The very latest gas stoves and fires boast fuel beds that are almost indistinguishable from real wood fires, so you can have the best of both worlds. One of the most appealing aspects of a gas stove or fire is the ability to have instant heat at the touch of a button. 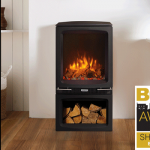 Even if you are still looking for a wood burning look, many gas stoves look just like a real log burner. Many modern gas stoves can also be controlled via remote control, giving you full control of your fire from the comfort of your sofa. 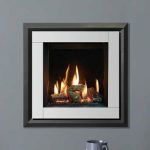 Gas stoves and fires come in a huge variety of shapes, sizes and finishes. Some, like the Gazco Loft gas stove, offer modular installation, giving you freedom of choice when it comes to the visual height and presence of the stove. Others might give you a variety of linings, frames and fuel effects, such as the Studio gas range. The Studio 1 Freestanding gas fire blends geometric angles with sweeping curves for a sleek contemporary finish. Offering a landscape view of rolling flames, this large format fire is available with a choice of a smoothly curved bench, or plinth mounting options, each echoing the fire’s distinctive design. There are a host of options to you to make it possible to have a gas stove or fire when you don’t have a chimney. 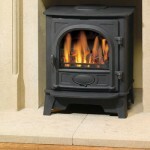 A conventional flue gas stove or fire requires a chimney or flue system in order to function. If you do not have a chimney, you may be able to have a pre-fabricated system installed. This works in the same way a normal chimney would. The other option is to go for a balanced flue gas stove or fire. 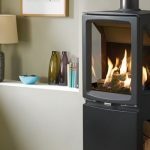 A balanced flue model does not need a chimney at all – read more about how a balanced flue gas stove or fire works here. Gas stoves and fires are also often available as LPG versions, making them suitable for homes out in the country that have no access to a mainline gas supply. You can find a new gas stove or fire by visiting your local retailer. 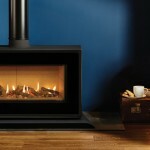 Studio 1 & 2 Freestanding Gas Fires – Brand new this season!